A modern first floor 2 bedroom, 2 bathroom apartment near Vera Playa on an award winning development set in beautiful landscaped gardens with sea view from the terrace. The development offers fantastic facilities including 3 pools (2 outdood and 1 indoor), spa with jacuzzi, sauna and steam room, gym, tennis court and childrens play area. Close to the town of Vera and approx 1km from the blue flag beaches of Vera Playa. Set within a secure gated development this is a modern first floor 2 bedroom, 2 bathroom apartment with good quality fixtures and fittings and air-conditioning. The apartment is fully furnished and equiped. The apartment has 2 bedrooms and sleeps 4. The Lounge and dining area has TV, DVD,CD and radio and has patio doors leading onto a south west facing terrace with sea and mountain views and facing the beautifully landscaped gardens. The kitchen is fully fitted with washing machine, dishwasher, microwave, fridge freezer and oven and hob and provides all crockery and cutlery etc required for your stay. There is also a hairdryer and all linens, bathroom and beach towels are provided. The master bedroom has an en suite bathroom and has fitted wardrobes with a Juliette balcony with views of the gardens and the surrounding mountains and countryside and the sea. The twin bedroom also has fitted wardrobes and there is a 2nd family bathroom. There is an allocated parking space close to the apartment. The secure, gated complex offers fantastic facilities with 2 outdoor pools, indoor pool, spa, gym, sauna, steam room jacuzzi, tennis courts, childrens play area and extensive landscaped gardens with seating areas and various water features including a waterfall. 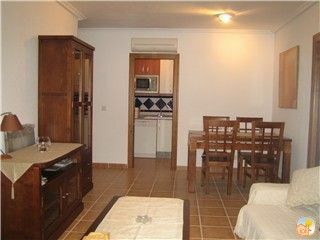 The apartment is situated near the town of Vera and the blue flag beaches of Vera Playa are approximately 1 Km away. The towns of Garrucha, Mojacar Pueblo and Mojacar Playa are within a short drive away , which offer a good selection of shops, restaurant, bars and nightlife. There are 4 golf courses in the area, again only a short drive away. The is an aqua park near Vera Playa which is 5 minute drive away and Go Karting in Garrucha. The twin bedroom has a room fan. The earliest arrival time is 6.00 and the latest arrival time is 23.00 for our housekeeper will be able to meet you at the apartment. For July and August the following check in and check out times apply Check in time is 16.00 Check out time is 10.00 Please limit smoking to the terrace only Car Hire is available locally at competitive rates via my housekeeper. Please email me for details. Fabuloso apartamento, una maravilla, un trato muy agradable con Anita, gracias por todo, tanto a Anita como a Maria. Dar las gracias a Maria y Anita, ha sido unos dias maravillosos en un complejo increible, ha sido un placer disfrutar de las vacaciones en Vera, el proximo año repetimos. Estoy muy contento de que haya disfrutado de su estancia en el apartamento. Esperamos que te ayude a planificar tu viaje. A fantasic apartment and a perfect holiday! We were met at the gate and shown to the apartment which was spotless and much larger than it appeared in the photographs. The complex was idyllic with car parking within the gated complex but outside of the pedestrianized areas which were lined with palm trees and obviously very well maintained. The Apartment itself had every thing that we needed and more - fridge/freezer, cooker, microwave, kettle and of course air conditioning. Breakfast on the balcony was a delight every morning. The local beaches and towns of Vera, Garrucha and Mojacar were all within an easy 10-15 minute drive and there was a well stocked supermarket less than a 5 minute drive away. A perfect place in the sun and we will most definitely be back. I cannot recommend this highly enough. The apartment was clean and well air conditioned. Easy to find and close to the pool teens courts etc. Excellent, exactly as we'd hoped. A beautiful complex maintained to very high standards. Lovely facilities including 2 pools, which were never too busy at anytime of day. Helpful staff on the complex. Very comfortable and well maintained apartment with great attention to little details such as well equipped kitchen and bathroom. Ideal location within the complex, quiet and shaded balcony which was super for eating together. Overall very good value of a family holiday a short drive from the beach and interesting and historic places to visit. Good watermark too! The blue flag beaches of Vera Playa and Puerto Rey are about 5 mins away offering a range of facilities including watersports and also offers a selection of bars and restaurants and shopping facilities. There is also an aqua park near Vera Playa. The fishing port of Garrucha is close by, approx 5 mins drive has a wide selection of shops and restaurants and is well known for its fish restaurants. The nighlight of Mojacar Playa is about 10 mins away and also has fabulous beaches. The pretty white washed village of Mojacar Pueblo which can be seen from the terrace has stunning views of the coast and countryside is well worth a visit and only a few mins away. The historic town of Vera is approx 5 mins away by car and has a large selection of shops, restaurants and bars. All the nearby towns have local market days. There are 4 golf courses nearby -Valle del Este, Desert Springs, Marina Golf at Mojacar Playa and Cortijo Grande - all within about 15/20 mins drive.